WASHINGTON - Continuing his efforts to promote renewable hydropower production in Oregon and throughout the Northwest, Rep. Greg Walden (R-Hood River) today voted to pass the Hydropower Policy Modernization Act (H.R. 3043) through the House of Representatives on a strong bipartisan vote. The Hydropower Policy Modernization Act originated in the Energy and Commerce Committee -- where Walden serves as Chairman -- and would modernize and streamline the licensing process for hydropower projects. "Hydropower plays an enormously important role in electricity generation across the country and especially in my home state of Oregon," said Walden. "Hydropower generates 43% of electricity in my state. It is dependable; it is baseload; it is carbon free; it is renewable; and it is very important to our region. 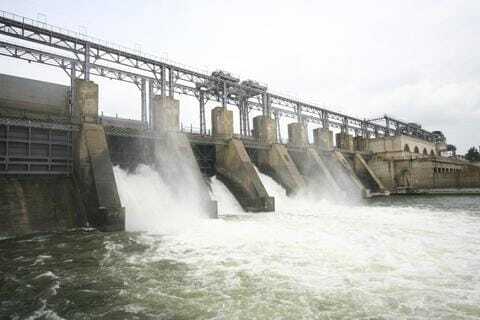 Nationally, hydropower is the largest source of renewable electricity generation and a recent Department of Energy report found that U.S. hydropower could grow by almost 50 percent by the year 2050. However, as my colleagues from the Pacific Northwest and across the country know, we are not taking full advantage of this valuable resource." * Reducing duplicative oversight from the multiple federal agencies that review hydro applications by designating the Federal Energy Regulatory Commission as the lead agency. The current licensing process of new hydropower facilities and relicensing of existing facilities is often costly and time consuming. Walden said that the Hydropower Policy Modernization Act will improve hydropower licensing, which will ultimately benefit ratepayers and consumers. "As these entities go to relicense, sometimes it costs tens of millions of dollars just to get a renewal of a government permit to continue doing what you've been doing. And it can take seven-to-ten years to work through the process," said Walden. "By the way, guess who pays for all of those costs? The ratepayers, the people paying their electricity bill end up paying for all of this out of control review and regulation." The Hydropower Policy Modernization Act passed the House on a bipartisan vote today, and now awaits action in the Senate.